Mark Engler is the author of two books. 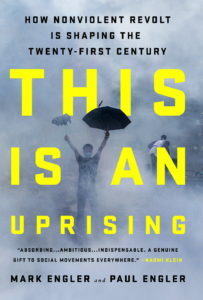 This Is an Uprising: How Nonviolent Revolt Is Shaping the Twenty-First Century, written with Paul Engler, was published by Nation Books in 2016. It has been lauded as “a landmark book” (Bill McKibben), “a genuine gift to social movements everywhere” (Naomi Klein), and “a true masterpiece on the history, logic, ethics, and power of nonviolent action” (Erica Chenoweth). Michelle Alexander, author of The New Jim Crow, states: “For all those who dare to dream that truly transformational, even revolutionary change might be possible here in America in our lifetimes (but who wonder what strategies or tactics could possibly achieve a monumental shift in consciousness), this book is for you. We have more power than we realize, and the compelling stories of nonviolent movements around the world told here have much to teach us about how we can use our power wisely.” Visit the web site for the book here. 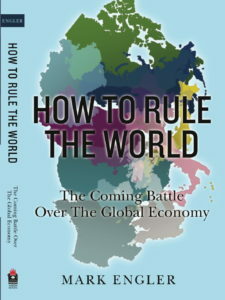 How to Rule the World: The Coming Battle Over the Global Economy was published by Nation Books in 2008. It was praised as “an essential handbook not for the few who do rule the world but for the many who should” (Greg Grandin) and selected by the Drum Major Institute as one of the “most interesting and informative progressive books” of the year. YES! Magazine editor Sarah Van Gelder writes, “Engler’s critical insight is that the two dominant approaches to U.S. foreign policy are in trouble…. [He] shows that both neoliberalism and neoconservatism are in disarray. This opens possibilities for new international relationships based on democratic values and aimed at increasing equity and sustainability. The possibility is there, but it will take a movement — a ramped-up global justice movement, for example — to assure that the next U.S. president doesn’t try to re-establish an old, failed pattern — or create still more chaos in the attempt.” Visit the web page for the book here.